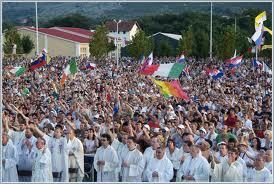 The 21st International Youth Festival with the main theme: “Good Master, what shall I do to inherit the eternal life” began in Medjugorje on August 1st with the evening Holy Mass and finished on August 6th, Feast of Transfiguration with the Holy Mass at 5 a.m. on the top of the Cross Mountain. Prior to the Holy Mass on first evening, young people from 69 various countries introduced themselves and were welcomed by Fr.Petar Vlasic, parish priest from Medjugorje. Opening Holy Mass was celebrated by Provincial of Herzegovina Franciscan Province, Fr. Ivan Sesar. Every evening there are around 500 priests who concelebrate at Holy Masses, and the entire programme is being simultaneously translated in various world languages: English, German, Polish, Slovakian, Italian, Spanish, Korean, Russian, Czech, Hungarian, Romanian, Portuguese, Arabian, Chinese, and Slovenian, while smaller language groups are translating in their own languages.